Samuel Wm. Sax is a native of Illinois, who was born in Grand Central Terminal in New York and raised in Peoria and Chicago, Illinois, and Miami Beach, Florida. Mr. Sax is the Chairman of Financial Relations, Inc., an international investment banking and advisory services firm, the former Chairman of Shield Technologies Corporation, a defense and industrial manufacturer, and Chairman of American Titanium Works, LLC, a mill. He serves, or has served, on multiple international banking, corporate and philanthropic boards. Mr. Sax served in various positions for several United States presidents.On November 8, 2016, he, was sworn in to his eighth five-year term as the ranking Commissioner on the Public Building Commission of Chicago. Mr. Sax is a retired senior Navy Reserve Officer. His naval career was principally as a Surface Warfare Officer (Mine Warfare Specialist), Public Affairs Officer and Strategic Officer. He is a former Chief Engineer and Commanding Officer of the USS Dynamic MSO-432, has had five important military commands, and served on the staff of Commander, Mine Force U.S. Pacific Fleet, NATO and in the Middle East. In June 2006, Rear Admiral Sax was appointed as the current Commander of the Illinois Naval Militia (Naval Guard). Mr. Sax is the retired Chairman and Chairman Emeritus of Exchange International Corporation and Exchange National Bank of Chicago, now merged with Bank of America; Founder and Chairman of the American/Israel Bank, Ltd.; the first fiscal agent for the United States government in the Middle East; is a principal founder and first Vice-Chairman and Director of the United States Navy Memorial Foundation; and a Trustee Emeritus of the United States Naval Institute Foundation. Mr. Sax’s civic involvement is extensive. In addition to his position on the PBC Board of Commissioners, he chaired the Regional and National Advisory Committee on Bank Practice and Policy, the Comptroller of the Currency for the Department of Treasury, served as Vice Chairman, United States-Israel Business Council of the U.S. Department of State, Chicago Clearing House Committee, the U.S. Department of Defense Executive Committee, the Museum of Modern Art, in New York, and the Art Institute of Chicago. 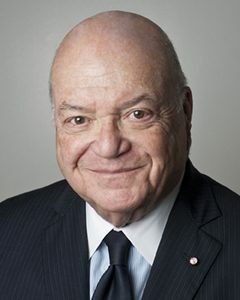 He served as Chairman of the Board of Governors of the Professional Photographers of American, Photographic Art and Science Foundation, and is founding chairman of the Chicago Corporation for Public Broadcasting (WYCC-TV, Channel 20) and founding vice-chairman of the City Colleges of Chicago Foundation. Among his various recognitions, Mr. Sax is the recipient of Prime Minister Medal, State of Israel, the Abraham Lincoln Humanitarian of the Year Award, National Academy of Television Arts and Sciences Special Recognition and Fortune Magazine’s National Business and the Arts Award. He is a graduate of the University of Illinois-Champaign as well as the Naval ROTC unit, where he was inducted into the Military Honor Society of Scabbard and Blade. He graduated from the University of Wisconsin Graduate School of Banking and the Harvard University Institute of Financial Management Graduate School of Business. Additionally, he is a graduate of the U.S. Naval War College, the U.S. Naval Mine Warfare School-Yorktown, and a member of the American Society of Naval Engineers. Mr. Sax is an active and long-time member of The Standard Club and The Chicago Yacht Club. He started sailing One Design Racing Boats at the age of ten and was a junior champion. Mr. Sax continued competitive racing in both sail and power, and holds several awards in both.